The sought-after development could aid the millions of people without ready access to clean drinking water. The promising graphene oxide sieve could be highly efficient at filtering salts, and will now be tested against existing desalination membranes. It has previously been difficult to manufacture graphene-based barriers on an industrial scale. Reporting their results in the journal Nature Nanotechnology, scientists from the University of Manchester, led by Dr Rahul Nair, shows how they solved some of the challenges by using a chemical derivative called graphene oxide. Isolated and characterised by a University of Manchester-led team in 2004, graphene comprises a single layer of carbon atoms arranged in a hexagonal lattice. Its unusual properties, such as extraordinary tensile strength and electrical conductivity, have earmarked it as one of the most promising materials for future applications. But it has been difficult to produce large quantities of single-layer graphene using existing methods, such as chemical vapour deposition (CVD). Current production routes are also quite costly. On the other hand, said Dr Nair, “graphene oxide can be produced by simple oxidation in the lab”. He told BBC News: “As an ink or solution, we can compose it on a substrate or porous material. Then we can use it as a membrane. Graphene oxide membranes have already proven their worth in sieving out small nanoparticles, organic molecules and even large salts. But until now, they couldn’t be used to filter out common salts, which require even smaller sieves. Previous work had shown that graphene oxide membranes became slightly swollen when immersed in water, allowing smaller salts to flow through the pores along with water molecules. Now, Dr Nair and colleagues demonstrated that placing walls made of epoxy resin (a substance used in coatings and glues) on either side of the graphene oxide membrane was sufficient to stop the expansion. Restricting the swelling in this way also allowed the scientists to tune the properties of the membrane, letting through less or more common salt for example. An extremely rare case of strep throat that almost killed an Alto man has instead taken his hands and feet. Kevin Breen, 44, was healthy and active when he started feeling sick on Christmas Day. “It didn’t seem that unusual,” he said. Days later, the unbearable stomach pain sent him to the emergency room. “I never thought (I’d be) going in for a stomachache and coming out a totally different person and (it’s) life-changing,” said Breen. 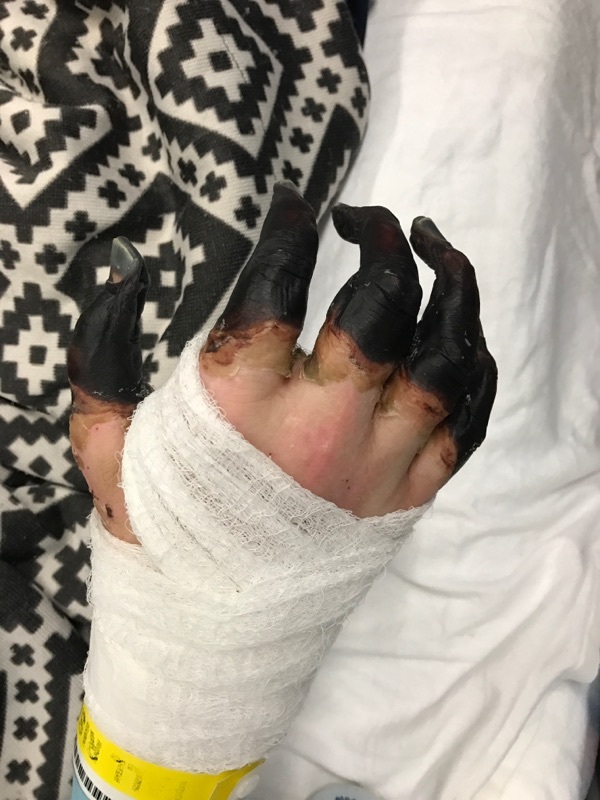 “He was one of the sickest patients I have ever taken care of,” said Dr. Elizabeth Steensma, an acute care surgeon at Spectrum Health Butterworth Hospital. Although Breen’s son had had strep and fought it off, Steensma didn’t think this was the same type of infection. Breen’s stomach was growing and hardening. A CT scan showed his stomach was filled with pus. Doctors thought maybe an organ was punctured, but they couldn’t find anything. “It was almost a mystery,” said Steensma. While doctors tried to pinpoint the source of the problem, Breen’s organs began failing. In an effort to save those organs, his body redirected blood flow to them — leaving the flesh of his hands and feet to die. At one point, his wife was told to gather family and prepare for the worst. Then there was a clue: a rash on his upper torso. Knowing that Breen’s son had strep throat, doctors ran a test and found a common sign of strep in his belly. The strep had traveled from his throat to his stomach, and his body couldn’t fight it. Breen had a strong strain of strep that he was very susceptible to. It was the perfect storm. Breen’s case is being studied by doctors at Spectrum Health. Dr. Steensma found 32 cases of patients with strep traveling to the abdomen, most involving women and their urinary tracts. Breen is one of two men in the world who had strep travel from his throat to stomach, according to Steensma. He returned home, but the infection had taken its toll. His hands and feet turned black and lost almost all movement — so doctors said they both hands and feet would have to be removed. Breen was the breadwinner for his family. He now relies on his wife and her teaching salary for pretty much everything. Throughout this whole ordeal, Breen has continued to smile. He’s not bitter, but happy to be alive and thankful for the doctors who saved him. Chairman of Japan’s nuclear regulation authority admits “we are still feeling around in the dark”. Barely a fifth of the way into their mission, the engineers monitoring the Scorpion’s progress conceded defeat. With a remote-controlled snip of its cable, the latest robot sent into the bowels of one of Fukushima Daiichi’s damaged reactors was cut loose, its progress stalled by lumps of fuel that overheated when the nuclear plant suffered a triple meltdown six years ago this week. As the 60cm-long Toshiba robot, equipped with a pair of cameras and sensors to gauge radiation levels was left to its fate last month, the plant’s operator, Tokyo Electric Power (Tepco), attempted to play down the failure of yet another reconnaissance mission to determine the exact location and condition of the melted fuel. Even though its mission had been aborted, the utility said, “valuable information was obtained which will help us determine the methods to eventually remove fuel debris”. The Scorpion mishap, two hours into an exploration that was supposed to last 10 hours, underlined the scale and difficulty of decommissioning Fukushima Daiichi – an unprecedented undertaking one expert has described as “almost beyond comprehension”. Cleaning up the plant, scene of the world’s worst nuclear disaster since Chernobyl after it was struck by a magnitude-9 earthquake and tsunami on the afternoon of 11 March 2011, is expected to take 30 to 40 years, at a cost Japan’s trade and industry ministry recently estimated at 21.5tr yen ($189bn). The figure, which includes compensating tens of thousands of evacuees, is nearly double an estimate released three years ago. The tsunami killed almost 19,000 people, most of them in areas north of Fukushima, and forced 160,000 people living near the plant to flee their homes. Six years on, only a small number have returned to areas deemed safe by the authorities. Developing robots capable of penetrating the most dangerous parts of Fukushima Daiichi’s reactors – and spending enough time there to obtain crucial data – is proving a near-impossible challenge for Tepco. The Scorpion – so called because of its camera-mounted folding tail – “died” after stalling along a rail beneath the reactor pressure vessel, its path blocked by lumps of fuel and other debris. The device, along with other robots, may also have been damaged by an unseen enemy: radiation. Before it was abandoned, its dosimeter indicated that radiation levels inside the No 2 containment vessel were at 250 sieverts an hour. In an earlier probe using a remote-controlled camera, radiation at about the same spot was as high as 650 sieverts an hour – enough to kill a human within a minute. Robotic mishaps aside, exploration work in the two other reactors, where radiation levels are even higher than in reactor No 2, has barely begun. There are plans to send a tiny waterproof robot into reactor No 1 in the next few weeks, but no date has been set for the more seriously damaged reactor No 3. Naohiro Masuda, the president of Fukushima Daiichi’s decommissioning arm, says he wants another probe sent in before deciding on how to remove the melted fuel. Despite the setbacks, Tepco insists it will begin extracting the melted fuel in 2021 – a decade after the disaster – after consulting government officials this summer. But Shaun Burnie, a senior nuclear specialist at Greenpeace Germany who is based in Japan, describes the challenge confronting the utility as “unprecedented and almost beyond comprehension”, adding that the decommissioning schedule was “never realistic or credible”. The latest aborted exploration of reactor No 2 “only reinforces that reality”, Burnie says. “Without a technical solution for dealing with unit one or three, unit two was seen as less challenging. So much of what is communicated to the public and media is speculation and wishful thinking on the part of industry and government. Toronto is experiencing a Mumps outbreak. All of the currently confirmed cases have been in adults between 18 and 35. CBC reports that “About 60 per cent” of them had not received the two recommended doses of the MMR vaccine. Lab results have confirmed that 14 people have become infected with the virus, so “about 60 per cent” is most likely 57% or 8 out of 14 people. That means that 6 of the 14 people or 43% were completely vaccinated. The MMR vaccine is ineffective. This recent outbreak in Toronto is far from the first time that vaccinated people have fallen ill . In 2014 we wrote about outbreaks in Massachusetts, Ohio and New York which were infecting vaccinated populations. 15 out of 15 students infected with whooping cough last month at Falmouth High School in Massachusetts had been vaccinated. At Fordham University in New York City all students are required to be vaccinated including the vaccination for mumps, measles, and rubella (MMR), but as of February 21st, 13 cases of the mumps had been reported with 100% of those infected having already been vaccinated. In Ohio, as of March 24th there were 63 reported cases & 97% of those infected had been vaccinated. In the following video Dr Obukhanych explains how protective serum titers drop very quickly after the second MMR dose, meaning some vaccinated people do not receive any lasting protection from the MMR vaccine. 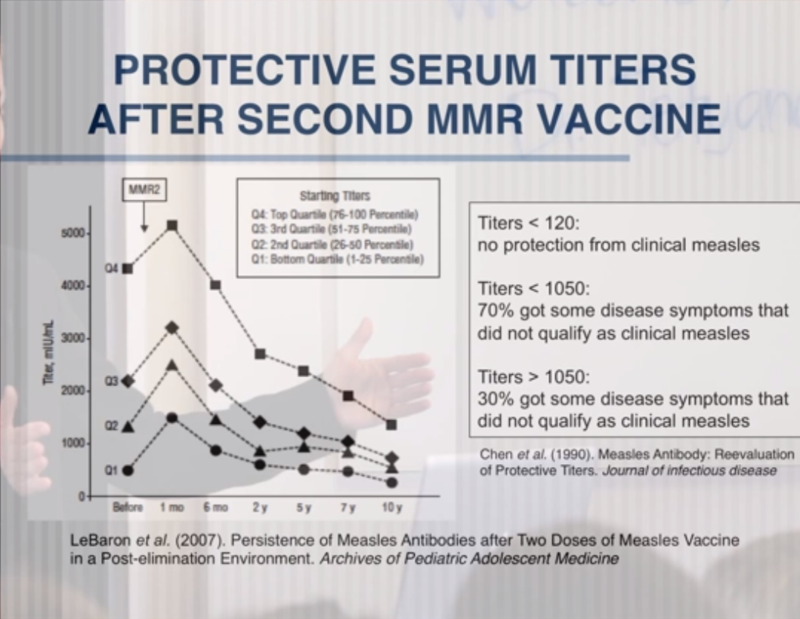 Here is a screenshot of the chart in the video highlighting the data which shows the MMR booster is not very effective & provides at best, leaky immunity. “In the original description of herd immunity, the protection to the population at large occurred only if people contracted the infections naturally. The reason for this is that naturally-acquired immunity lasts for a lifetime. The vaccine proponents quickly latched onto this concept and applied it to vaccine-induced immunity. But, there was one major problem – vaccine-induced immunity lasted for only a relatively short period, from 2 to 10 years at most, and then this applies only to humoral immunity. This is why they began, silently, to suggest boosters for most vaccines, even the common childhood infections such as chickenpox, measles, mumps, and rubella. Another robot sent to investigate the crippled Fukushima nuclear plant has been abandoned after succumbing to extreme radiation levels. The “Scorpion” robot, designed by the Tokyo Electric Power company (TEPCO), experienced catastrophic failure as it approached the core of reactor number two due to “unimaginable” radiation levels. It is the second robot TEPCO has been forced to abandon inside the crippled plant, which suffered a catastrophic meltdown during an earthquake and subsequent tsunami in 2011, phys.org reports. The advanced robot had been carrying two small cameras and other sensor equipment in an attempt to locate melted fuel cells inside the plant. As it suffered the failure, it was moved to a position so as not to hinder future expeditions. It was then shut down and abandoned. Earlier this month, TEPCO revealed the radiation level in the containment vessel of reactor two had reached more than of 530 sieverts per hour. The “unimaginable” radiation levels were assessed by the National Institute of Radiological Sciences (NIRS). According to the NIRS, just 4 sieverts of radiation exposure would be enough to kill a handful of people. Earlier this month, TEPCO sent in its first exploratory robot to clear debris out of the way for future missions. The robot’s cameras shut down when it exceeded its maximum tolerance of 1000 sieverts. TEPCO has insisted it will continue to push forwards with missions to examine the crippled reactors one at a time, as pressure mounts from the public and government officials to officially decommission the plant – an endeavour the company is still unsure how to accomplish. US Central Command (CENTCOM) spokesman Maj. Josh Jacques told Airwars and Foreign Policy that 5,265 armor-piercing 30 mm rounds containing depleted uranium (DU) were shot from Air Force A-10 fixed-wing aircraft on Nov. 16 and Nov. 22, 2015, destroying about 350 vehicles in the country’s eastern desert. US and coalition aircraft have not been and will not be using depleted uranium munitions in Iraq or Syria during Operation Inherent Resolve. Now we know that is not true. …DU damages DNA in human lung cells. The team, led by John Pierce Wise, exposed cultures of the cells to uranium compounds at different concentrations. The compounds caused breaks in the chromosomes within cells and stopped them from growing and dividing healthily. ‘These data suggest that exposure to particulate DU may pose a significant [DNA damage] risk and could possibly result in lung cancer,’ the team wrote in the journal Chemical Research in Toxicology. We should remember that the United States is engaged in military activities in Syria in violation of international and US law. There is no Congressional authorization for US military action against ISIS in Syria and the United Nations has not authorized military force in violation of Syria’s sovereignty either. The innocent citizens of Syria will be forced to endure increased risks of cancer, birth defects, and other disease related to exposure to radioactive materials. Depleted uranium is the byproduct of the enrichment of uranium to fuel nuclear power plants and has a half-life in the hundreds of millions of years. Damage to Syrian territory will thus continue long after anyone involved in current hostilities is dead. With just 3 years left until the 2020 Olympics, Japan is likely desperate to reassure the world’s athletes that all is well, but an admission from TEPCO – the Fukushima nuclear plant operator – that they discovered a hole at least one square meter in size beneath the reactor’s pressure vessel, and lethal record-high radiation levels have been detected, will not likely reassure anyone. Radiation levels of up to 530 Sieverts per hour were detected inside an inactive Reactor 2 at the Fukushima Daiichi nuclear complex damaged during the 2011 earthquake and tsunami catastrophe, Japanese media reported on Thursday citing the plant operator, Tokyo Electric Power Company (TEPCO). A dose of about 8 Sieverts is considered incurable and fatal. As RT reports, a hole of no less than one square meter in size has also been discovered beneath the reactor’s pressure vessel, TEPCO said. According to researchers, the apparent opening in the metal grating of one of three reactors that had melted down in 2011, is believed to be have been caused by melted nuclear fuel that fell through the vessel. The iron scaffolding has a melting point of 1500 degrees, TEPCO said, explaining that there is a possibility the fuel debris has fallen onto it and burnt the hole. Such fuel debris have been discovered on equipment at the bottom of the pressure vessel just above the hole, it added. The latest findings were released after a recent camera probe inside the reactor, TEPCO said. Using a remote-controlled camera fitted on a long pipe, scientists managed to get images of hard-to-reach places where residual nuclear material remained. The substance there is so toxic that even specially-made robots designed to probe the underwater depths beneath the power plant have previously crumbled and shut down. However, TEPCO still plans to launch further more detailed assessments at the damaged nuclear facility with the help of self-propelled robots. TEPCO confirmed a black lump in the space beneath the pressure vessel. There is a possibility of nuclear fuel melting down (fuel debris). Magic mushrooms, once associated mostly with Phish concerts, may lead to better end-of-life care for cancer patients. One dose of the active ingredient, psilocybin, can help terminal cancer patients experience less depression and anxiety even six months later. Scientists from Johns Hopkins University in Baltimore and NYU Langone Medical Centre in New York carried out trials on a total of 80 volunteers with cancer who had reported symptoms of depression and anxiety. Participants were given either a high dose of psilocybin, the active ingredient in magic mushrooms, or a placebo. They then took part in a psychotherapy session during which they were encouraged to focus on their inner experiences while researchers monitored them. A few weeks later, the patients had a second session with the other drug. In the Johns Hopkins study, 83 per cent of participants reported “decreases in measures of depression, anxiety and mood disturbance, and increases in measures of quality of life, life meaning, death acceptance and optimism”, New Scientist reports. The effect appears to be long lasting. “Six months after the final session of treatment, about 80 per cent of participants continued to show clinically significant decreases in depressed mood and anxiety,” Medical Xpress reports. The Guardian reports that the effects of magic mushrooms have been of interest to psychiatry since the 1950s, but the hardening of the US government’s attitude towards recreational drug use after the late 1960s created “daunting legal and financial obstacles to running trials” with psychedelics. A large earthquake has struck off the coast of Japan’s troubled Fukushima prefecture. Registered at a magnitude of 7.4 by the Japan Meteorological Agency (JMA), tsunami warnings have been issued for Fukushima and neighbouring Miyagi prefectures, with the JMA urging residents to immediately evacuate coastal areas and reach higher ground. Waves of up to three metres are expected to repeatedly strike the area. According to the JMA, other parts of northeastern Japan should expect waves between 0.2 and one metre. Waves measuring 1.4 metres have already been reported by the JMA. A magnitude 7.4 earthquake has struck off the coast of Fukushima – the site of 2011’s devastating 8.9 quake and resulting tsunami – at Tuesday 5.59am local time (Monday 8.59pm GMT). Tsunami warnings were issued for the Fukushima and Miyagi prefectures, with waves at Sendai port recorded at 1.4m high. The warnings have since been downgraded, although residents are still advised to move to high ground and avoid the shore. At the Fukushima Daini nuclear power plant, reactor number 3 spent fuel pool pump stopped operating at 6.10am as a result of the quake. Operation resumed at 7.49am and the plant is reported to be safe and “intact”. So far, five people are reported to have suffered minor injuries in the quake. Nissan is suspending work at its Fukushima factory, while flights to and from Sendai airport have been disrupted. Decommissioning work at the Fukushima Daiichi plant, destroyed in the 2011 quake, has been temporarily suspended. Although doctors maintain that flu shots are life-savers that everyone should receive, some researchers are uncovering hints that “serial vaccination” — that is, consistently receiving annual flu shots — may in fact limit one’s ability to fight the virus in the future. Although flu season typically starts in late November and peaks towards the end of December, influenza cases have already been reported across Canada, with spikes occurring over the past month in southern British Columbia, western Manitoba and southwestern Ontario though numbers remain low. New evidence, however, is raising the spectre that the more influenza vaccinations you receive in your lifetime, the less protection you have from the virus in subsequent seasons. Skowronski published a study earlier this year showing that people who were vaccinated consecutively in 2012, 2013 and 2014 appeared to have a higher risk of being infected with new strains of the flu. “If we’re seeing some signals of declining vaccine protection, we want to respond to that — but we don’t want to overreact,” Skowronski cautiously says. Skowronski’s study, however, is one of several that suggest a similar troubling pattern. In the aftermath of 2009’s H1N1 flu epidemic, the Canadian flu surveillance network reported that Canadians who had received a flu shot in late 2008 were between 1.4 and 2.5 times more likely to contract an H1N1 infection that required medical attention, compared with those who didn’t get a shot. A more recent report even states that during the 2014-2015 flu season, those who had not been vaccinated the previous year were more likely to benefit from flu shots than those who received them two years in a row. To discuss these troubling findings, Skowronski convened a meeting in Vancouver in mid-October with 40 scientists from around the world. “The actual implications of current findings are unclear — but important enough to warrant investigation — to differentiate signal from noise,” Dr. Mark Loeb, a scientist with McMaster University who is conducting research into the question, said in an email to CTV News. The flu vaccine works by producing antibodies that can repel only a particular strain of influenza. Scientists alter the vaccine on an annual basis to better combat the ever-changing virus. The 2014-2015 flu season, however, was particularly bad in terms of the vaccine’s usefulness. In Canada, its effectiveness was rated at a meagre nine per cent that season. Although more research is needed, it’s now believed that annual flu shots may make it harder for the immune system to fight off new strains of the virus that show up after immunization. More studies are underway in Canada, the U.S. and Europe to determine this. Quebec, however, has already put its multi-million dollar flu vaccination program under the microscope. “The Ministry wants to know what were the findings and how can we optimize the program for the province,” Dr. Gaston De Serres of Quebec’s public health institute told CTV News in an email. The utility that ran the Fukushima nuclear plant acknowledged Tuesday its delayed disclosure of the meltdowns at three reactors was tantamount to a coverup and apologized for it. TEPCO instead described the reactors’ condition as less serious “core damage” for two months after the earthquake and tsunami on March 11, 2011, wrecked the plant, even though utility officials knew and computer simulations suggested meltdowns had occurred. An investigative report released last Thursday by three company-appointed lawyers said TEPCO’s then-President Masataka Shimizu instructed officials not to use the specific description under alleged pressure from the Prime Minister’s Office, though the investigators found no proof of such pressure. The report said TEPCO officials, who had suggested possible meltdowns, stopped using the description after March 14, 2011, when Shimizu’s instruction was delivered to vice-president at the time, Sakae Muto in a memo at a televised news conference. Shimizu had a company official show Muto his memo and tell him the Prime Minister’s Office has banned the specific words. Government officials also softened their language on the reactor conditions around the same time, the report said. Greg McNevin, a photographer working with Greenpeace, explored areas of Russia and Japan that have been “decontaminated” and are apparently supposed to be safe for people to live and grow food. His work visualizes the radiation that persists in these so-called decontaminated areas. McNevin juxtaposes radiation data onto long exposure photographs. At least five people have died and five others are in critically condition caused by drug use at a music festival in Buenos Aires say Argentine health officials. At the Time Warp festival two people died on Friday, followed by three more deaths in an ambulance or at a hospital. Repealing prohibition so that people can legally access drugs of verified purity, would likely prevent these types of death. Without a legal market, consumers will continue to be killed by lethal adulterants. Barack Obama will ask the U.S. Congress for more than $1.8 billion in emergency funds to fight Zika at home and abroad and pursue a vaccine, the White House said on Monday, but the president also said there is no reason to panic over the mosquito-borne virus. Zika, spreading rapidly in South and Central America and the Caribbean, has been linked to severe birth defects in Brazil and public health officials’ concern is focused on pregnant women and woman who may become pregnant. Obama’s request to Congress includes $200 million for research, development and commercialization of new vaccines and diagnostic tests for the virus. In addition, the London-based European Medicines Agency (EMA), Europe’s drugs regulator, said it has formed an expert task force on Zika to advise companies working on vaccines and medicines against the virus. There are no vaccines or treatment for Zika and none even undergoing clinical studies, as the disease had previously been viewed as relatively benign. Most infected people develop either no symptoms or mild ones like a fever and skin rashes. Two years after being fined for falsifying safety records, nine months after a transformer exploded at the Indian Point Nuclear Reactor just 37 miles from midtown Manhattan, and two months after Entergy – the plant’s operator – shut down the Unit 2 reactor after a major power outage cut power to several control rods (when the company assured that no radioactivity was released into the environment), this afternoon NY Governor Andrew Cuomo said he learned that “radioactive tritium-contaminated water” had leaked into the groundwater at the nuclear facility in Westchester County. Cuomo, in a letter Saturday to the state Health Department and the Department of Environmental Conservation, called for the probe into the Indian Point NPP after he said Entergy, the plant’s owner, reported “alarming levels of radioactivity” at three monitoring wells, with one well’s radioactivity increasing nearly 65,000 percent. It is unclear if the facility was taking a page out of the Fukushima “crisis response” book, or was being honest when it said that the contamination has not migrated off site “and as such does not pose an immediate threat to public health.” For the sake of millions of downriver New Yorkers, we hope it was the latter. “Yesterday I learned that radioactive tritium-contaminated water leaked into the groundwater at the Indian Point Nuclear facility. The company reported alarming levels of radioactivity at three monitoring wells, with one well’s radioactivity increasing nearly 65,000 percent. The facility reports that the contamination has not migrated off site and as such does not pose an immediate threat to public health. “Our first concern is for the health and safety of the residents close to the facility and ensuring the groundwater leak ‎does not pose a threat. Despite Indian Point’s denial that the contamination has migrated off site, Cuomo said that the incident requires a full investigation. There was no immediate comment from Indian Point on the situation, Lohud reported. The plant, located in Buchanan, NY which supplies about 30 percent of the energy to New York City, has been under increased scrutiny from Cuomo’s office, and the Democratic governor supports closing the plant, even as he supports keeping open two other upstate nuclear facilities. In December, Cuomo ordered an investigation into Indian Point after a series of unplanned shutdowns, citing its risks being just outside the city and in the populated suburbs. “A causal relationship between Zika virus infection and birth malformations and neurological syndromes … is strongly suspected. [These links] have rapidly changed the risk profile of Zika, from a mild threat to one of alarming proportions. Zika seemingly exploded out of nowhere. Though it was first discovered in 1947, cases only sporadically occurred throughout Africa and southern Asia. In 2007, the first case was reported in the Pacific. In 2013, a smattering of small outbreaks and individual cases were officially documented in Africa and the western Pacific. They also began showing up in the Americas. In May 2015, Brazil reported its first case of Zika virus — and the situation changed dramatically. Brazil is now considered the epicenter of the Zika outbreak, which coincides with at least 4,000 reports of babies born with microcephaly just since October. When examining a rapidly expanding potential pandemic, it’s necessary to leave no stone unturned so possible solutions, as well as future prevention, will be as effective as possible. In that vein, there was another significant development in 2015. Though that might sound like an astounding success — and, arguably, it was — there is an alarming possibility to consider. Nature, as one Redditor keenly pointed out, finds a way — and the effort to control dengue, zika, and other viruses, appears to have backfired dramatically. The particular strain of Oxitec GM mosquitoes, OX513A, are genetically altered so the vast majority of their offspring will die before they mature — though Dr. Ricarda Steinbrecher published concerns in a report in September 2010 that a known survival rate of 3-4 percent warranted further study before the release of the GM insects. Her concerns, which were echoed by several other scientists both at the time and since, appear to have been ignored — though they should not have been. Those genetically-modified mosquitoes work to control wild, potentially disease-carrying populations in a very specific manner. Only the male modified Aedes mosquitoes are supposed to be released into the wild — as they will mate with their unaltered female counterparts. Once offspring are produced, the modified, scientific facet is supposed to ‘kick in’ and kill that larvae before it reaches breeding age — if tetracycline is not present during its development. But there is a problem. “An outbreak in the Western Hemisphere could give countries including the United States new reasons to try wiping out mosquitoes with genetic engineering.